Our PERSONAL CHEF SERVICE led by Head Chef, Mohammed Tadimi, is an enjoyable experience as more and more of our clients find they no longer have time for food preparation at home. Our clients are not only celebrities throwing non-stop lavish parties, but also professional people with hectic schedules who don't have the time or interest to plan, shop for and prepare daily meals or entertain friends or clients. Research indicates that discerning consumers are tired of relying on restaurants and supermarket ready made meals, and prefer to eat freshly prepared, preservative and additive-free feasts at home. Also people leading hectic lives would much rather entertain at home because it's a safer, more comfortable environment. There's a preception that having your own personal chef is an extravagant luxury. But just consider the cost of eating out, organising a babysitter, taxi fares or parking and eating out really does add up! The Exotic Tagine PERSONAL CHEF SERVICE prepared at your home works out far cheaper than you realise and allows you, the hostess/host, to put your feet up. At Exotic Tagine we work with a small number of regular clients on a weekly basis and several more on a casual arrangement, e.g. annual dinners, celebrations, birthday parties to name but a few. The bespoke service provided by Exotic Tagine is like having your own personal chef who strives to provide a banquet to your precise requirements. 1. We sit down together and create the perfect menu for you and your guests. 2. We give you a quotation based on your choices. 3. A small deposit* confirms your order. No fuss. No mess. No work for you. Just sit back and relax with your friends knowing the evening will run smoothly. 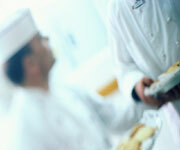 Click here to see how we can satisfy your catering requirements.